We have a lot Events packed into the next weeks, here’s a handy list with links. Solutionary Rail is a Just Transition proposal for a green energy future, uniting diverse stakeholders, powering trains with clean renewable energy, and using railroad rights of way for high voltage transmission of wind and solar power. Learn more about this visionary yet do-able plan to decarbonize our transportation and energy infrastructure at solutionaryrail.org/summary. In 2016, Standing Rock, North Dakota became one of the most watched places on earth. 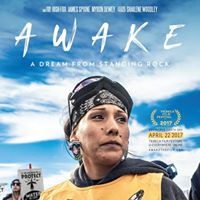 Josh Fox James Spione Myron Dewey Digital Smoke Signals are honored to present a new documentary ‘AWAKE, A Dream From Standing Rock,’ which captures some of the many stories of the Native-led resistance against the Dakota Access Pipeline, which forever changed the way people approach the fight for Indigenous sovereignty and the resistance to fossil fuel infrastructure, Big Oil and climate change. Science Event at Grays Harbor College, April 22, Details to follow. The People’s Climate March for Climate, Jobs, & Justice April 29, 1pm Zelasko Park, between Heron & Wishkah at F Street, Aberdeen. This is a sister march in solidarity with theWashington DC March. Join our 4th annual rally at Zelasko Park for music, Solar and Wind displays and speakers. Then we will gather tamborines, cowbells, drums, kazoos & train whistles as our People’s Marching Band travels along Heron, cross to Wishkah and return to the rally. Free & Kid friendly! Indigenous Climate Justice Symposium at Evergreen Longhouse May 4-5, 10am, 2700 Evergreen Parkway NW, Olympia. The 2nd annual Indigenous Climate Justice Symposium will be held on Thursday, May 4 and Friday, May 5 in The Evergreen State College’s Longhouse Education and Cultural Center. This year the Symposium theme is “A Time for Gathering.” The event is free and open to the public. May 5-7, Hoquiam. After all that, you deserve to see what we are fighting to protect, so head over to Bowerman Basin and walk the Sandpiper trail atGrays Harbor Shorebirds and Nature Festival. The Quinault Indian Nation invites everyone to come to Hoquiam for a March on City Hall and Rally on Friday, July 8th. Make your voice heard by joining the Quinault Indian Nation for a SHARED WATERS, SHARED VALUES march and rally in the City of Hoquiam. There is no cost to attend. You can RSVP at Stand Up To Oil‘s action link. WHO: Quinault Indian Nation leaders, fishermen, elected officials, local residents, conservationists and anyone who cares about the health of Grays Harbor. Help greet the flotilla of traditional canoes, fishing boats and kayaks arriving from Grays Harbor to dock along the Hoquiam River to kick off the march and rally. Everyone who lives, works and enjoys Grays Harbor and Washington’s coastal waters has a stake in keeping them safe from crude oil. From oil trains and giant tanker shipments to on-site storage of millions of gallons of crude oil, the risk of proposed oil terminals outweighs any benefits. Boats can enter the water at the 28th Street Landing and paddle over to the new dock at 9th Street, to come ashore at 1:30pm. ! 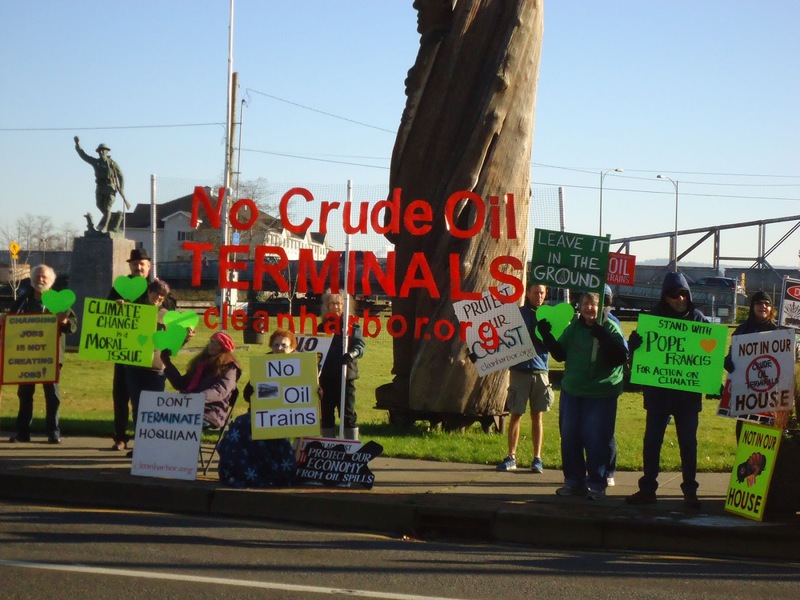 The dangers of oil trains have understandably dominated headlines about proposed oil terminals in Washington state. As a long-time crab fisherman out of Grays Harbor, I’m very concerned about another risk that has so far gotten far less attention yet deserves equal time in the public spotlight: the consequences of a major oil spill for our local economy, environment and way of life. Grays Harbor is an essential fish habitat for many species and a major nursery area for Dungeness crab. The tribal and non-tribal average crab catch value, based on state and tribal estimates, is $44 million a year. The annual economic benefit is $80 million to $150 million, depending on the multiplier used. In 2014 Washington residents took an estimated 4.1 million trips to the Washington Coast spending $481 million, according to a Surf Rider Foundation study. More than one-third of those visits were to Grays Harbor County to enjoy all our coastal waters have to offer. The state is expected to soon release for public comment a draft environmental impact statement (DEIS) for the first two of three crude oil terminal proposals in Grays Harbor. No crude oil presently moves through Grays Harbor. Yet, if the terminals are built, oil tanker and oil barge traffic is expected to increase vessel visits by 450 percent, adding 750 oil-vessel bar transits annually. The Grays Harbor shipping channel is narrow, shallow, subject to strong current flows, and has limited staging area for ships and tugs. The Washington Department of Fish and Wildlife stated, “Grays Harbor is an area particularly sensitive to the adverse effects of oil spills.” The introduction of such huge volumes of oil transport and oil vessel traffic in an area not suited to them in the first place is inviting disaster. Grays Harbor is simply a poor choice for oil terminals. Between trains, tanks, ships and barges, up to 115 million gallons of oil will be in Grays Harbor at any one time. We know from disasters like the Deepwater Horizon in the Gulf of Mexico and Exxon Valdez in Alaska that one major oil spill can be devastating: contaminating coastlines, killing fish and wildlife, destroying livelihoods and ruining property values. The damage can last for decades, even generations. One major spill is one too many. The proposed oil terminals threaten not just Grays Harbor, but our state’s entire coast, a place cherished by millions. Those who care must engage in the DEIS comment process to tell our state leaders to put our waterways, our jobs, and our communities ahead of oil companies’ relentless pursuit of expanding markets and profits at our peril. Larry Thevik has fished Grays Harbor and the coast for 45 years in pursuit of salmon, halibut, tuna, prawns and Dungeness crab. He is vice president of Washington Dungeness Crab Fishermen’s Association. See our other pages for DEIS comment procedures, and upcoming activities and events. Please visit this site often as we bring you updated news about this potentially dangerous project which may be approved by your Port Commissioners. A new study on the impacts of crude oil transportation through Grays Harbor was released last month by Resource Dimensions of Gig Harbor. The group was retained by the local non-profit group Friends of Grays Harbor to conduct the independent study of two-year impacts of a hypothetical oil spill in our area in the year 2020. While the study admits it didn’t factor in jobs created from the disaster, the group estimates between 650 and 1000 jobs and hundreds of millions of dollars in business revenue could be lost in the event of a spill at one of three proposed terminals. You can view the entire report online at the Friends of Grays Harbor website. Map of Statewide Concern: Oil Check Northwest has compiled the official statements of concern and opposition to Crude by Rail from cities, governments and major organizations in Washington State and put them together in an interactive map. There are a total of 2 counties, 9 major organizations and 25 cities that have officially voiced concern or outright opposition to oil trains in their communities. With groups from the Washington State Council of Firefighters to the Columbia River Inter-Tribal Fish Commission and cities from Spokane to Aberdeen to Bellingham its clear how diverse and widespread opposition is in the Evergreen State. You can check out the full map here. As new cities and groups consider the risks and come out in opposition let us know and we’ll be sure to add them to the list. Let’s Participate in EFSEC Tesoro DEIS Hearings in Vancouver! On Tuesday, Jan 5th, your voice is needed. We will have a Van (or Bus), but we need to know if you can come along. Please reply to this email. This will help us make plans, which need to get started before the holidays. Meanwhile, please write a Letter to the Editor, and stress this is not a “Done Deal”. Public participation can stop Westway and Imperium plans which are all Risk and no Benefits for the Harbor. See our other pages here for more commenting information too!